Servers | KGS | An interview with legendary tartrate (Kim Myungwan, 9p). Ask your questions! 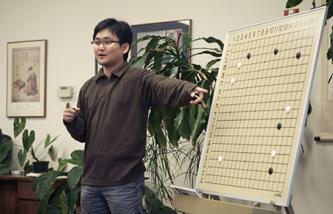 An interview with legendary tartrate (Kim Myungwan, 9p). Ask your questions! I just wanted to do that problem thing. Were you really tartrate? Also whats most important for improving and how important are blitz games? why did you start playing on kgs? where any of the players there intresting? are you thinking of the possibility of giving lessons on kgs? Do you plan to come back to KGS some time? We really miss your great games! Will you come to the European Go Congress in France this summer ? And will you plan ti visit France/Europe? What about interview with MilanMilan ?